I’ve read and reread Joan Didion’s essay On Self-Respect more times this month than I have fingers and toes. When you’ve hit rock bottom and you’re not even five days into the month, staring at a reflection of yourself wearing a wash-worn two-piece hospital gown that hangs on you like a sack and donning an unintentionally expressive pompadour, realizing that this will be “Day 1” of an indefinite hospital stay, you’re left reconsidering where things turned south. And so I thought about Didion and how she gets to the heart of things about the origins of self-respect, where she suggests, “character – the willingness to accept responsibility for one’s own life – is the source from which self-respect springs.” That quote has been running through my mind, along with the tangential idea of recognizing the importance of fighting for something, and the gray, abstract areas associated with negotiating with who gets hurt in that fight. 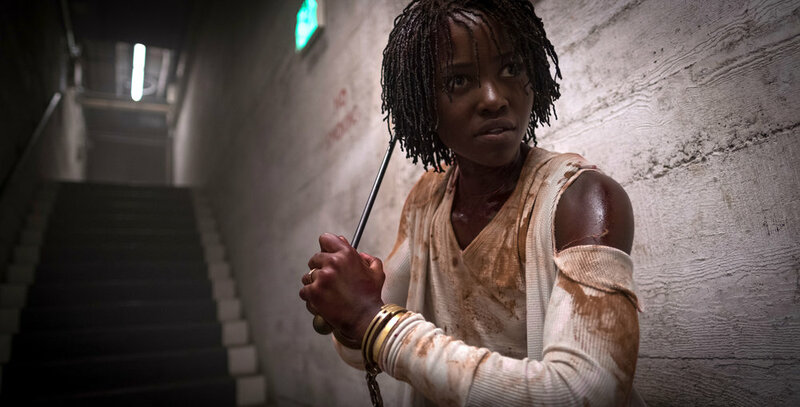 Us, Jordan Peele’s intriguing, messy, and relentlessly sensory new film, is about this idea of leaving the bargaining table behind, refusing to ask permission for rights or apologizing for deficiencies, and executing the moral nerve to seize the life that you want. The film’s opening passages take place in 1986, where images of Hands Across America are displayed on a television screen as an eerie premonition. We then follow Adelaide (Madison Curry) to a carnival with her bickering parents. Her father wins her an oversized “Thriller” t-shirt, which sets up another series of arguments between the two. Adelaide observes, holding her candied apple as she soaks in the setting, a vibrant display of humanity and bright flashing lights. She wanders off on her own, into a hall of mirrors, where she confronts something that haunts her into her adulthood. Now played by Lupita Nyong'o and taking place in the present, Adelaide returns to Santa Cruz and the beachfront where her childhood trauma took place, this time with her own family in tow. Peele and Nyong’o navigate the fraught, emotional terrain of Adelaide’s trauma unevenly, the former prone to deploying comic rejoinders through the orbiting familial characters (a similar problem I had with the structure of Get Out and its deployment of Lil Rel Howery’s character) whereas Nyong’o utterly demolishes even the highest of expectations, capable of generating such warmth and sensitivity that fends off the grief that outlines so much of Us. As the film proceeds, Nyong’o’s performance crystalizes in her doppelganger, Red. It’s not necessarily a performance of emotional contrast, but a vibrant exercise in sociopolitical, even elemental, dichotomies: bourgeoisie versus proletariat, fascism and diplomacy, despair and hope, literal light and darkness. Us’ mythology and the origins of the tethered, sewer-inhabiting doppelgangers that invade and ultimately attempt to replace the members of Adelaide’s family is best left unaddressed. The exhausting whys and whences behind much of the narrative only serves to limit the imagination, and ultimately muddles what I initially took to be an intriguing polemic on the daunting shadow that makes overcoming trauma Herculean in magnitude. And it’s only when confronted with certain doom, an extinction of comforts, routines, and the dissolution of support where Us is at its most frightening. The terror here is real: a terror of isolation, a terror of past mistakes coming back to haunt you, and a terror of inescapability.